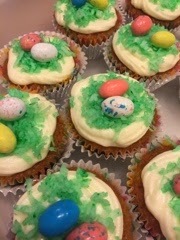 Easter Carrot Cupcakes are an easy and delicious treat to make! This is the same recipe that I use for carrot cake made in a 9x13" pan (so moist and yummy! )-but I make these in cupcakes as they are fun to decorate for different occasions! Mix dry ingredients together. Add sugar, eggs, and oil. Mix well. Add carrots, pineapple and nuts. Fill 3/4 way into cupcake liners and bake for approximately 20 minutes. Check for doneness by inserting a toothpick into the center. Beat 8 oz cream cheese until fluffy. Cream 1/2 cup butter. Add 1 tsp vanilla. Stir in 1/2 box powdered sugar and beat until smooth and of spreading consistency. You can spread with a knife, or I like to frost using a bakers bag. Decorate with shredded coconut (about 1 cup) mixed with two small drops of green food dye. Top with candy eggs.